Editor's note: This story is part of an ASU Now series celebrating the centennial of the Grand Canyon National Park. The Grand Canyon has incredible power. It united three backpackers with a shared passion, then separated them in tragedy. Andrew Holycross is the third person to have walked the length of the Grand Canyon on both sides of the river, and the ninth to thru-hike the canyon. A thru-hike is walking from Lees Ferry at the eastern end to Pearce Ferry at the western end (or vice versa) in one continuous push, without leaving the canyon. Thousands have summited Mount Everest. Twelve people have stood on the moon. Fewer than 10 people have thru-hiked the Grand Canyon. And Holycross did it the year after his wife fell to her death there. Matthias Kawski is a President’s Professor in Arizona State University’s School of Mathematical and Statistical Sciences. He came to the university in 1987 because of Arizona’s canyons and mountains. He backpacked the Grand Canyon the year he arrived, and the year after that. He was hooked. “That was the reason I stayed,” Kawski said. Holycross walked the south side in sections over a decade. Kawski was with him on most of those trips. Ioana Hociota and Holycross, a herpetologist and adjunct professor in ASU’s School of Life Sciences, met in 2006. A Romanian immigrant, Hociota earned dual degrees from ASU in biology and mathematics. A year after they met, they went backpacking in the canyon. She loved it. They returned, over and over. Kawski had been diagnosed with multiple sclerosis in 2004. His doctor told him his goal had to be minimize immobility. The German math professor in love with wide open spaces was told he faced using a wheelchair, blindness and brain fatigue over the next five to 10 years. “I was totally devastated,” Kawski said. “Ioana brought me back to life." The trio did 12 serious, sustained, six- to 10-day trips together in freezing conditions in extremely remote parts of the canyon. Eventually they started looking at the map. In 2010, Hociota convinced Kawski, then six years post-MS diagnosis, to come on an eight-day trip along the Sinyala fault in the western canyon. It’s a 17-mile-long fracture breaking through a cliff band. “No way,” was the response. Way too dangerous. Tripping. Falling. Sudden paralysis. Probably a helicopter rescue. In June 2011, Holycross and Hociota were married on the rim. The following winter, Hociota asked Kawski to join her in knocking out a section Holycross and another friend had already completed. It was a loop around the Great Thumb Mesa, a finger of land on a bend in the river in the western end of the canyon, next to the Havasupai reservation. The route was 16 miles. They planned to do it in three days. They would start Feb. 24 and hike out on Feb. 26. When the terrain wasn’t too difficult, they followed different paths. When it was challenging, they stayed closely together. On the second day, Hociota contoured around a hill while Kawski chose to go over the top. Kawski heard rocks tumble, then a sharp scream. Hociota fell about 300 feet. No one knows exactly what happened. She was not a reckless hiker, according to Holycross. More than likely, it was just bad luck. A misstep on the wrong rock. About 12 people die each year in the Grand Canyon. The tally to date is about 700, according to "Over the Edge: Death in Grand Canyon," the definitive work on the subject. At the time of her death, Hociota had logged 830 miles in the canyon. She had 80 miles left to become the youngest person to complete a sectional thru-hike of the entire canyon. Feb. 26, 2019, is the park’s centennial. Ten days after her death, Holycross and Kawski went back to the canyon. Why keep going back after her death? “My first inclination when we got the news was a visceral hatred of the canyon because, in my mind, that’s what took her,” Holycross said. “But I realized that feeling doesn’t make sense; it’s not rational. “That feeling didn’t last long. It was sort of a fleeting thing. Later, the more I thought about it, that was the place where Ioana and I were at our best. As a couple we were peas in a pod down there. She loved it there. In fact, there’s a saying in Romanian when you get married: ‘Casa de Piatră.’ House of Stone. We said that was the canyon for us. The park has four different types of trails. Corridor trails are the superhighways like Bright Angel and South Kaibab, where the mule trains travel and which rangers recommend to first-time visitors. Corridor trails are regularly maintained and patrolled, with water stations and other goodies. Threshold trails, like Hermit and Thunder River, are maintained when something is damaged by storms or floods. They’re regularly visited, but not by the hordes you see on Bright Angel. Primitive trails are far out there. You’re not likely to see anyone else. Nankoweap is the hairiest of the primitive trails, with some crazy exposure, meaning there’s a long way to fall. Then there are wilderness routes. Triple black diamond. You won’t see another soul. These are footpaths or animal trails — at best. You’d better know what you’re doing, because you are out there. There are no trails along 95 percent of the North Rim or along 80 percent of the South Rim. Being a great outdoorsman is not about being great at one thing. It’s about being great at 1,000 little things. How to stay warm. How to stay cool. How to read terrain, maps and ground for routes that “go.” Or don’t go. How to assess risk, judge it and execute it. Where people like Holycross and Kawski go, something as small as a broken bootlace can lead to your death 48 hours later. Make one mistake, and problems combine, compound and get worse. When people do a sectional hike of the canyon, they go up on weekends and vacations and knock out sections. It can take people decades to complete. Only about 40 people have done it. A thru-hike means you don’t come out of the canyon until it’s done. You don’t take breaks by taking a weekend off in a town, for instance. You might take a layover day where you stay in camp and repair gear and catch up on sleep, but you don’t leave. When Holycross did his thru-hike on the north side, it was more than 500 miles. But because hiking Grand Canyon is almost never in a straight line, he estimates he walked close to 600 miles. Holycross cached half of his supplies ahead of time, stored in five-gallon buckets hidden in the canyon. The remaining buckets were placed by friends from the river. “I had to find them,” he said. “That was nerve-wracking.” There were 11 buckets total. He had custom topographic maps printed out — he doesn’t like GPS — and each section was stashed in his cache buckets. What does two months of solitude do to your head? “It gives it a different kind of scramble than this place does,” Holycross said, sitting in a Starbucks under a flight path and next to six lanes of rush-hour traffic. Find water. Find the route. Stay safe. Kawski was way behind Hociota and Holycross when they expected to have section-hiked the length of the canyon on the south side in spring 2012. So, eight years after being diagnosed with multiple sclerosis, Kawski decided to hell with the disease, he was going to do it. At that time he had completed the Old Park and Monument, and a small section of Marble Canyon. Sixty miles of Marble Canyon remained — a very different landscape and challenge, consisting of steep slopes with little vegetation, narrow terraces on the east and south sides, and extreme bushwhacking on the final section along the river. A year later, he completed his sectional thru-hike at the confluence of the Colorado and Little Colorado Rivers. Kawski is among the approximately 40 people who have completed this feat. Tragedy can transform. Hociota's example of honoring life by living it fully left an indelible mark. Holycross now is remarried to another remarkable and vibrant woman; the couple have two beautiful daughters. Kawski and Holycross remain the closest of friends and have continued to raft and hike the canyon over the past seven years. Kawski and Holycross established the Ioana Elise Hociota!!! Memorial Mathematics Scholarship at ASU to honor her life. The scholarship helps support the educational dreams of immigrant women in mathematics. There have been seven recipients from seven countries to date. Make donations to the scholarship to increase the number of recipients reached. All photos courtesy of Andrew Holycross and Matthias Kawski. 3D-printing technology is taking the world by storm. The ability to print virtually any item with diverse materials is driving the creation of houses, prosthetic limbs, dental implants and more. 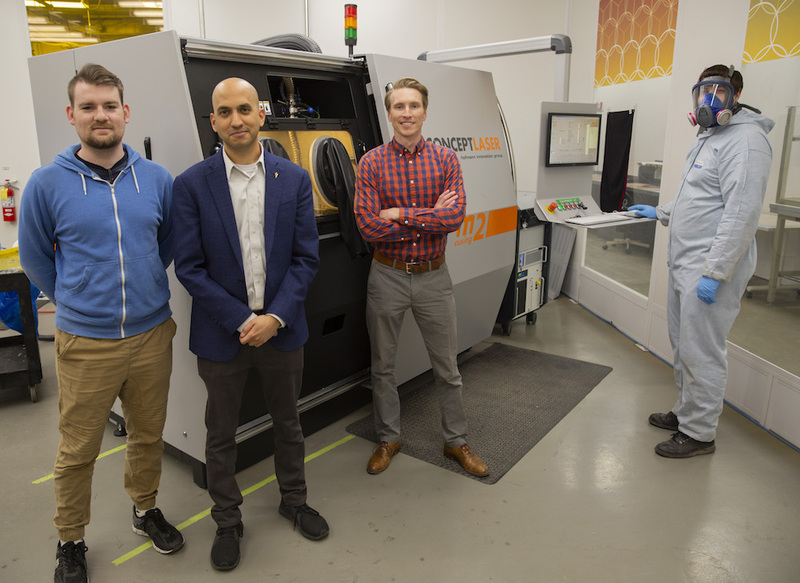 America Makes, the national accelerator for additive manufacturing, recently chose Arizona State University to lead a $1 million directed project opportunity to advance additive manufacturing postprocessing techniques. The Air Force Research Laboratory will fund the project with supplemental matching funds from the university and its three research collaborators. Bhate attributes winning the award to the university's investment to launch the 15,000-square-foot Manufacturing Research and Innovation Hub located on the Polytechnic campus. 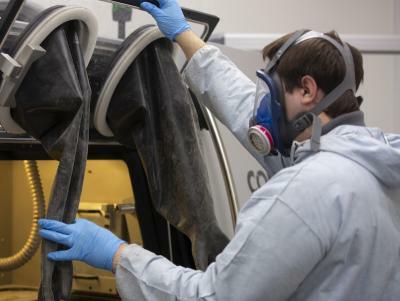 The space boasts $2 million in cutting-edge polymer, composite and metal 3D-printing equipment along with advanced processing, design and analysis capabilities to enable students, faculty and industry partners to help accelerate the growth of additive manufacturing. Metal additive manufacturing has caught the eye of the Air Force Research Laboratory as a capability that enables rapid innovation. Its specific interest has centered around the use of selective laser melting, a technique designed to use a high-power-density laser to melt and then fuse metallic powders. However, a better understanding of structural properties and the impact of postprocessing techniques are needed to ensure the laser melting technique can be reliably used to produce qualified parts and certified processes. The current lack of consensus about best practices for material handling and postprocessing leads to higher costs to adopt and employ these technologies. 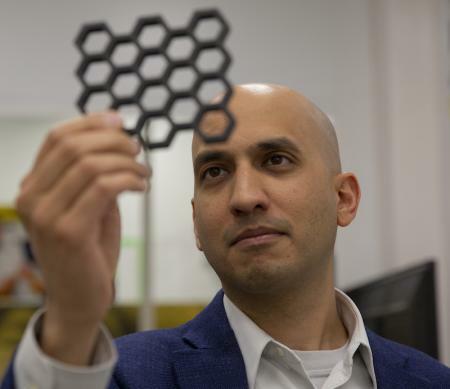 The main issue the research team will tackle is gaining a deeper understanding of how mechanical properties — such as stiffness, strength and fatigue life — of additive-manufactured metal structures change as a function of size. Smaller parts are especially important to the Air Force Research Laboratory because of its interest in fabricating high-temperature nickel superalloys with thin walls and narrow flow channels suitable for aerospace applications. There are some examples of 3D-printed parts accepted by the Federal Aviation Administration and approved for implementation in aerospace applications, said Bhate, but the vast majority are not as-built structures. They’ve gone through significant postprocessing techniques, which can be expensive, especially when dealing with very small, very complex designs. The project team will also explore the fundamental reasons for how mechanical properties change during postprocessing techniques, such as hot isostatic pressing. This thermal processing technique applies high temperature and pressure to rid the metal structure of voids, or little pockets of gas trapped in the part. The team will conduct a controlled study in which some parts will undergo hot isostatic pressing to determine the effectiveness of the technique and how it varies as a function of size. The Polytechnic School researchers will be responsible for the additive manufacturing of parts and mechanical testing. Two of Bhate’s students have begun the planning and preparation needed to make the project successful. The team’s other collaborators, Phoenix Heat Treating and Quintus Technologies, will be responsible for heat treatment and hot isostatic pressing, respectively, to determine the outcome of subjecting thin parts of varying sizes to different thermal conditions.